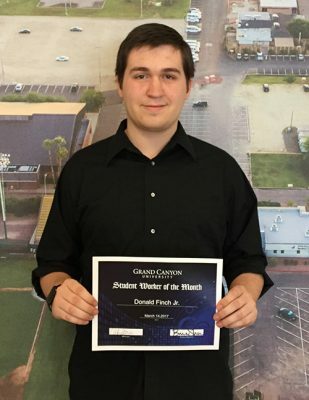 Student Worker of the Month: Donald Finch Jr.
For a shining example of a servant leader, look no further than Donald Finch Jr., a quality assurance (QA) specialist in Technical Support who is the Student Worker of the Month for March. From mentoring new hires to creating new documents and processes to creating fun videos in his free time to help the team relax, Donald “has become one of our success stories. He is humble, hard-working and has a caring spirit,” said his hiring manager, Cat Lena. A junior Justice Studies major, Donald is aiming to become a prosecution lawyer, perhaps even as a District Attorney someday. He enjoys his major because his professors truly make the learning practical by providing hands-on learning and lightening the mood with funny jokes. Donald definitely understands the value in being a student worker, too. He said his experiences as a golf instructor and math tutor for an elementary school and a library intern at his high school, combined with his time in Technical Support, have helped him hone skills relevant to becoming a lawyer. “Being in QA has definitely helped me improve my critical thinking in terms of what to look for in the QA call and how it can be applied, which I’ll need to do as a lawyer,” he said. His various roles also have helped him develop strong communication, organization and presentation skills, which he definitely will need in his career. The truly humble person that he is, Donald would like to thank his hiring managers — Lena, Carlos Navar and Jovan Lee — for being so nice and for making QA so enjoyable. Best of luck to you, Donald!